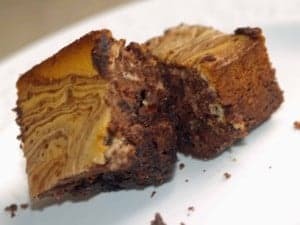 Maybe you have heard of cream cheese brownies, or even zebra brownies before. This was something we spotted one year around Christmas. This combines chocolately brownies, cream cheese, and Kalhua. These copycat Sara Lee Brownies have an extra special added flavor. Cream together cream cheese, 1 egg, 1/4 cup sugar, Vodka, 2 tablespoons of flour and 2 tablespoons of soft butter, set aside. In a separate bowl, make the cocoa mixture by sifting the remaining flour, sugar, cocoa, salt, baking powder. Stir in remaining butter and 1/2 cup Kahlua, ad 1 egg at a time and mix well into the sifted dry ingredients. Pour half cocoa mixture in a buttered and lightly floured 9" baking pan. Add cream cheese mixture, use your knife to swirl the cream cheese mixture into the cocoa mixture. Top the cream cheese layer with the remaining cocoa mixture. Bake at 325 degrees for about 30 minutes. When the cool brush with 1/4 cup of remaining Kahlua. Do not cut them so hard that you will mash them. Be gentle when cutting them especially when they are warm. I have re-written the instructions. Let me know if you need additional help. Is the butter melted or is it softened then creamed into the flour mixture?